I am really happy that PENDOWN is gradually finding its foothold in the print world. I had two bylines and 1 small contribution in two magazines this month . 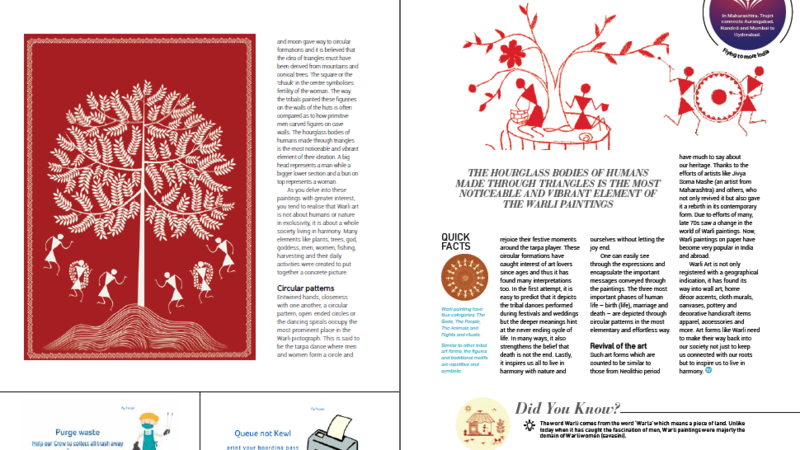 My article around Warli art has been published in the May-June edition of TRUJETTER magazine. If you do not have a journalist background, it is very difficult to find a foothold in the world of print and media. One doesn’t really know what is a travel pitch and what it takes to receive a reply from the editors. When you do get to know, you are not sure what to write in the pitch to make it sound catchy. There was no one to help me too. I learned by reading here and there and consulting some of my friends who often got published. Below is what I proposed to the editor. Some say its origins date back to 3000 B.C while others claim it to be 10th century A.D. However, one of the most interesting art form of India that hails from North Shahyadri was recognized as a tribal art only in 1970. Practiced by Warli tribes of Maharastra, Warli art is one of the most raw and rustic way of showing the way of life, rituals, people, festivals, common practices, realism and more. Warli art is easily recognizable for its stick figures making use of basic geometric patterns like dots, circles and triangles. I like it for it is as simple as it could be, being just about two colors –mud color and white. Originally, they were made from a mixture of cow dung and red mud but now all sorts of colors are used to beautify it. 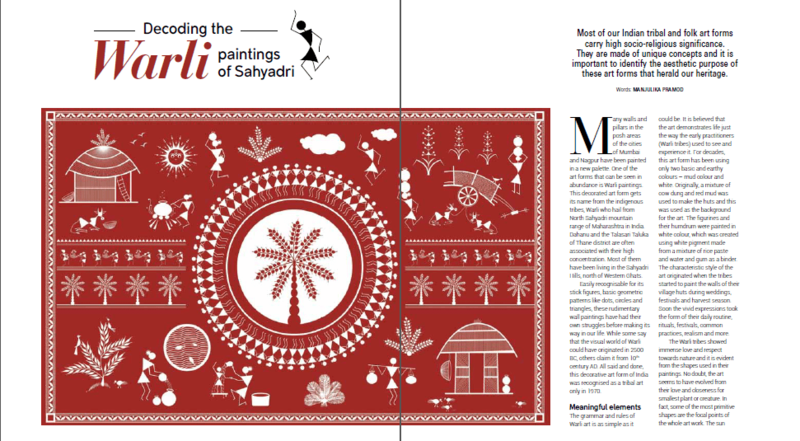 This article will highlight the characteristics of the art, how it connects us with our roots, its relevance, reasons for its slow death and why such traditional art forms like Warli need to make their way back into our society. In the last few years, a lot of efforts are being made to save the heritage. My recent trips to Mumbai and Nagpur assured me that some people have immense love and fondness for this art and they will not let it die. After I got a positive response from the editor, I drafted the below article. Most of our Indian tribal and folk art forms have lived a common fate. They really had to tread a long journey to create a stir in the artistic and culturally rich society. Despite the fact that they are very interesting, they carry high socio-religious significance, they are made of unique concepts, they have all failed to garner our attention in the first go. And no one but we are to be blamed for this. We, the educated class, busy in running a race against time have never really bothered to pay attention to these simple and gorgeous things of life. Due to the efforts of others, things might have changed for the good but until we stop and stare, we will never be able to identify the aesthetic purpose of these art forms that herald our heritage. Also, it is important to look around to find coherence in these pretty pieces of art work and get inspired. Many walls and pillars in the posh areas of the cities of Mumbai and Nagpur have been painted in a new palette. 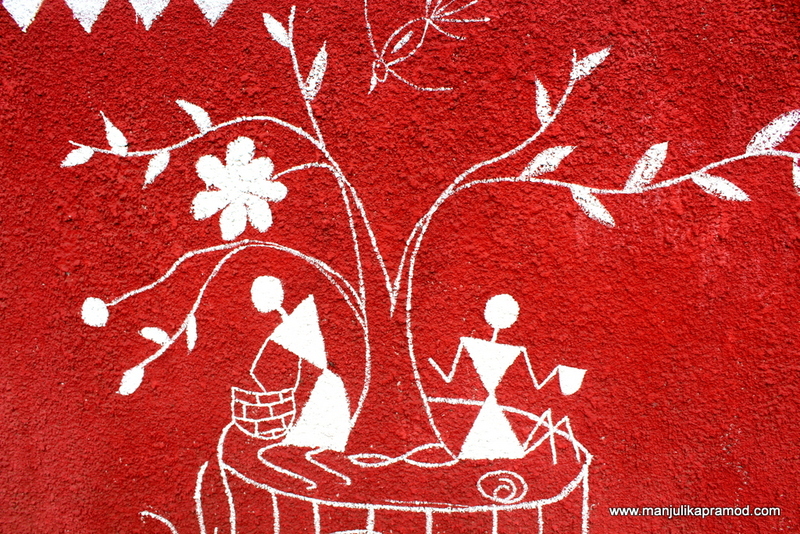 One of the art forms that can be seen in abundance is Warli paintings. These decorated art form gets its name from the indigenous tribes, Warli who hail from North Sahyadri mountain range of Maharashtra in India. Dahanu and the Talaseri Taluka of Thane district are often associated with their high concentration. Most of them have been living in the Sahyadri Hills north of Western Ghats. 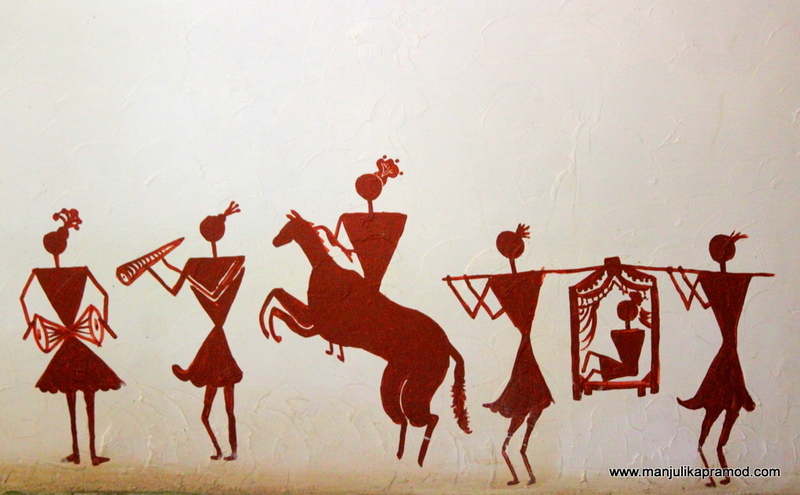 The stick figures of Warli Art caught my fascination. Easily recognizable for its stick figures, basic geometric patterns like dots, circles and triangles, these rudimentary wall paintings have had their own struggles before making its way in our life. While some say that the visual world of Warli could have originated in 2500 B.C, others claim it from 10th century A.D. All said and done, this decorative art form of India was recognized as a tribal art only in 1970. Thankfully, the complete death was averted. For the uninitiated, let us decode the patience, skill, intricate detailing, motifs and symbols of Warli. The talent and accuracy that goes in making and preserving these art forms is another chapter in itself. 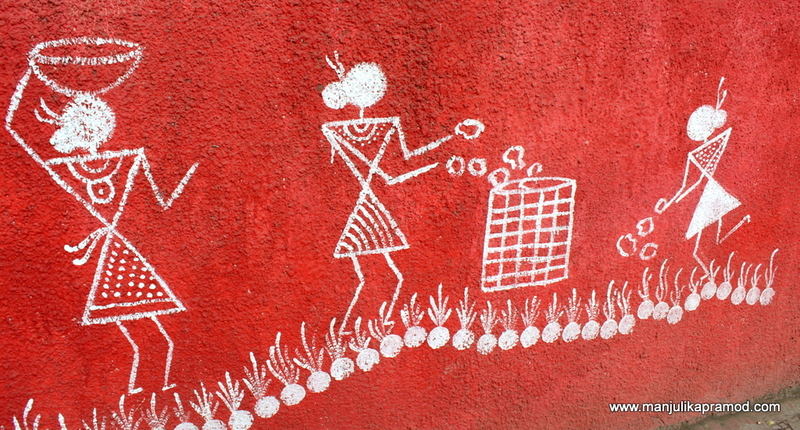 Warli art has simple but meaningful elements to it! The grammar and rules of Warli art is as simple as it could be. It is believed that the art demonstrates life just the way the early practitioners (Warli tribes) used to see and experience it. And if this wasn’t enough, you will be happy to learn that for decades this artform has been using only two basic and earthy colors –mud color and white. Originally, a mixture of cow dung and red mud was used to make the huts and this was used as the background for the art. The figurines and their humdrum was created with white color, whcih was created with the use of white pigment made from a mixture of rice paste and water, using gum as a binder. The characteristic style of the art originated when the tribes started to paint the walls of their village huts during weddings, festivals and harvest season. Soon the vivid expressions took the form of their daily routine, rituals, festivals, common practices, realism and more. The Warli tribes showed immense love and respect towards nature and it is evident from the shapes used in their paintings. No doubt the art seems to have evolved from their love and closeness for smallest plant or creature. In fact, some of the most primitive shapes are the focal points of the whole art work. The sun and moon gave way to circular formations and it is believed that the idea of triangles must have been derived from mountains and conical trees. The square or the “chauk” in the center symbolizes fertility of the woman. The way the tribals painted these figurines on the walls of the huts is often compared as to how primitive men carved figures on cave walls. The hourglass bodies of humans made through triangles is the most noticeable and vibrant element of their ideation. A big head represents a man while a bigger lower section and a bun on top represents a woman. As you delve into these paintings with greater interest, you tend to realize that Warli art is not about humans or nature in exclusivity, it is about a whole society living in harmony. Many little elements like plants, trees, God, Goddess, men, women, fishing, harvesting and their daily activities were created to put together a concrete picture. What is about the circular patterns? Entwined hands, closeness with one another, a circular pattern, open ended circles or the dancing spirals occupy the most prominent place in the Warli pictograph. This is said to be the tarpa dance where men and women form a circle and rejoice their festive moments around the tarpa player. These circular formations have caught interest of art lovers since ages and thus it has found many interpretations too. In the first attempt, it is easy to predict that it depicts the tribal dances performed during festivals and weddings but the deeper meanings hint at the never ending cycle of life. In many ways, it also strengthens the belief that death is not the end. Lastly, it inspires us all to live in harmony with nature and ourselves without letting the joy end. 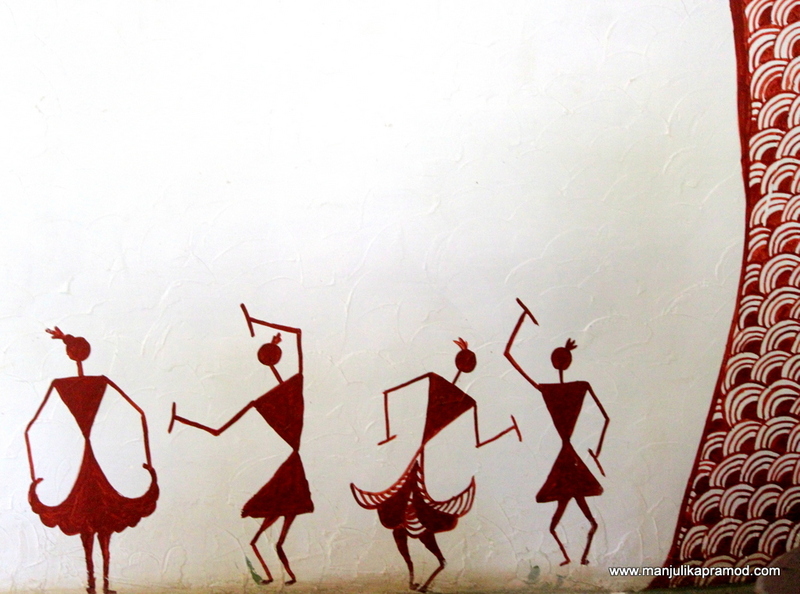 Warli art is very simple and about simple elements of life. 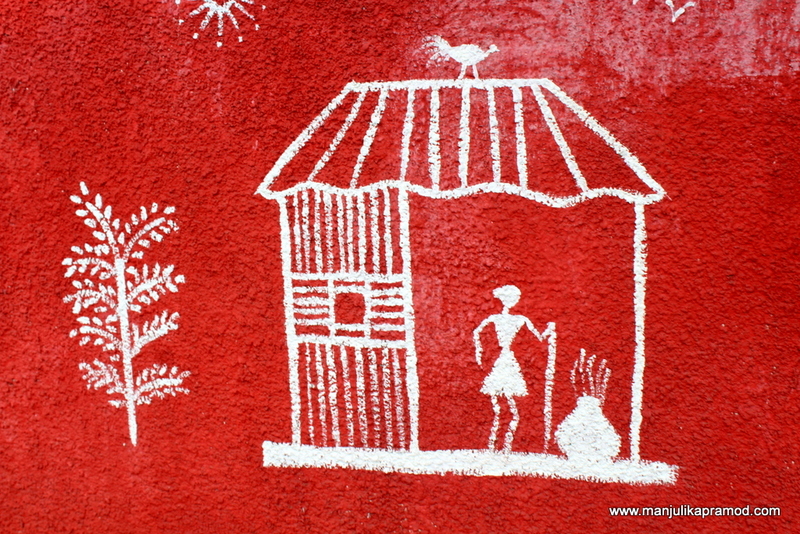 As Warli paintings catch your fascination, there is an urge to decode its meaning. Interestingly, it isn’t complicated like today’s world. 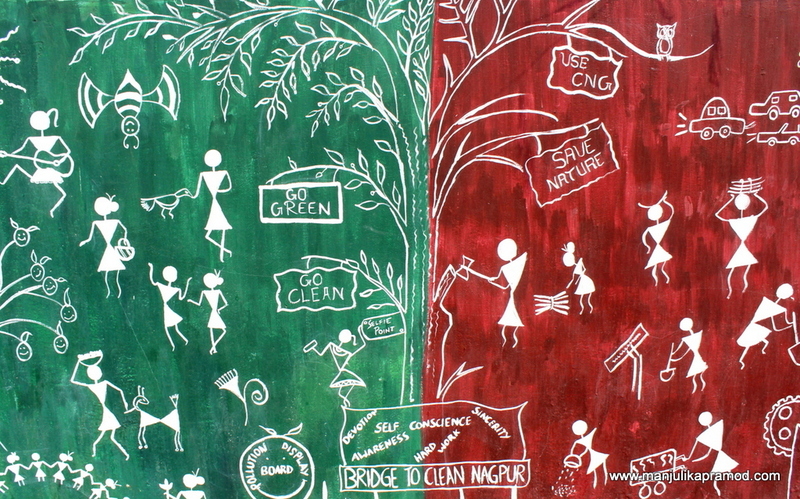 One can easily see through the expressions and encapsulate the important messages conveyed through the paintings. In fact, the three most important phase of their life – birth (life), marriage and death rites are depicted through circular patterns in the most elementary and effortless way. Give it a thought, cyclic nature is akin to everything even today. Warli is an intellectual property now! Such art forms which are counted to be similar to those from Neolithic period have much to say about our heritage. How could we let it die? Our ignorance had pushed it to slow death but thanks to the efforts of artists like Jivya Soma Mashe and others, who not only revived it but also gave it a rebirth in its contemporary form. The task of revival was not easy but where there is a will, there is a way. Due to efforts of many, late 70’s saw a change in the World of Warli paintings. Now, Warli paintings on paper have become very popular in India and abroad. Warli Art is not only registered with a geographical indication, it has found its way into wall art, home décor accents, cloth murals, canvases, pottery and decorative handicraft items apparel, accessories and more. Art forms like Warli need to make their way back into our society not just to keep us connected with our roots but to inspire us to live in harmony. The word Warli comes from the word ‘Warla’ which means a piece of land. Unlike today when it has caught the fascination of men, Warli paintings were majorly the domain of Warli women (savasini). 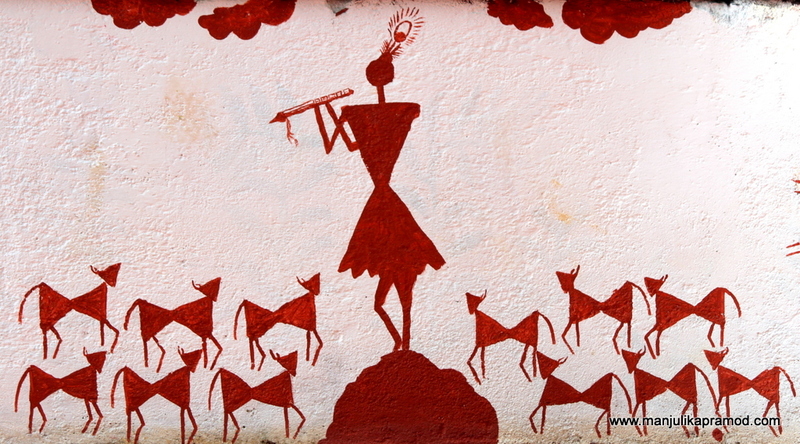 Warli painting have four categories: 1) The Gods, 2) The People, 3) The Animals and 4) Rights and rituals. Similar to other tribal art forms, the figures and traditional motifs are repetitive and symbolic. After the editing, the article was published. You may read the final version of the article at the below link. Don’t forget to turn the pages!